Oh, how quickly we forget just a few decades ago. Whether it is an inherited intolerance, oversimplification of irrational belief, or, hell, blaming prescription drugs, there appears to be a growing crevasse between cultures here in The United States as of late. Yvette Saatchi Perez, et al, set out to change just that. Attempting such, however, begs the question of what can one artist do to make such great strides? Under the moniker Mitra Sumara, Perez, along with Peter Zummo, Peter and Bill Ruyle, Julian Maile, Jim Duffy, Nikhill Yerawadekar, Michale Evans, and Kaveh Haghtalab, set their sights to the past with a firm foundation in the present to bring their debut Tahdig into the light. 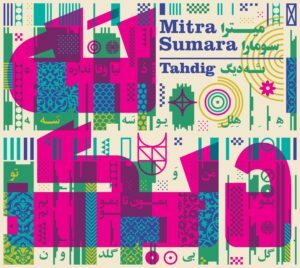 Crafting, what is coined as Farsi Funk, Mitra Sumara blends the 60s and 70s funk/disco stylings found in the Middle East not so long ago with a reflective mentality of homage and revelation. Balancing the Farsi lyrics with retro instrumental assemblies, Tahdig airs out in ten tracks that beautifully respect the roots. The airy waves of Perez’s voice dance amongst tracks that are, let’s face it, at their core, just fun, fun retro-funk sounds interlaced with horn, percussion, and tantalizing heritage flair. “Bemoon ta Bemoonam” begins with a horned chaos, borderline crashing before takeoff, before settling into a dance of bass and keys, finding the rhythm of Tahdig that lasts, and grows, in tracks like “Miravi,” as it sways and swoons, and digs itself in with “Mosem-e Gol.” The aim of the debut was to nod to a seemingly lost past while bringing a fresh face to it all. There’s no denying that’s a large undertaking. Definitively, Mitra Sumara succeeds. Tahdig is born out of a curiosity to ones heritage but it basks in the glow of a sound that is vibrant and bold. Balanced in an era of growing heritage curiosity, Tahdig, is far more appealing than spitting into a tube and mailing it off. A beacon of beauty in a world preconceived hostility, Mitra Sumara indeed, does a hell of a job of building bridges, not walls, with their dancing debut. This entry was posted in Reviews and tagged album, CD, farsi, funk, Mitra Sumara, review, Tahdig by Greg. Bookmark the permalink.